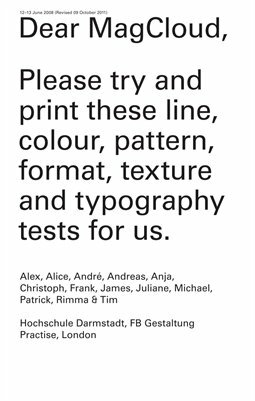 “Dear MagCloud” is a test book researched and produced by graphic design students and Prof. Frank Philippin at Hochschule Darmstadt, Germany, during an intensive two-day workshop with London-based designer James Goggin (Practise). First made to test the print-on-demand capabilities of lulu.com and bod.de, the book's intention is to act as a calibration document for testing colour, pattern, format, texture and typography. Exercises in colour profile (Adobe RGB/sRGB/CMYK/Greyscale), halftoning, point size, line, geometry, skin tone, colour texture, cropping and print finishing provide useful data for other designers and self-publishers to judge the possibilities and quality of online print-on-demand — specifically MagCloud, with this edition. The original A5 book size made for Lulu and BoD has been scaled down by 90% to MagCloud’s 5.25×8.25in ‘Digest’ format. The book’s price is set at MagCloud’s exact base price for a 100pp full colour softcover, with no profit.